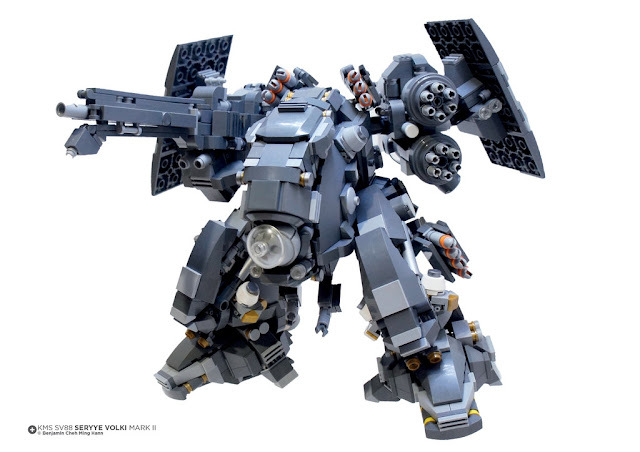 This amazing heavy mecha is built b flickr member and LEGO Sci-fi master builder Benjamin Cheh Ming Hann. This mecha is called KMS SV88 Seryye Volki MARK II and it is as detailed as the creators previous impressive MOC's like IWM Type 68 Diguetia and Hangar Maintenance Diorama. I like mechas with lots of weapons and greebles and this MOC is full of them. Gray color scheme makes the mechas look more realistic and metallic.